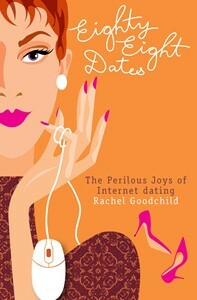 Today, we welcome Rachel Goodchild, an author and journalist who just released Eighty-Eight Dates, a great book on dating in the Internet age. Internet dating. Everyone’s doing it. Maybe even you? Whether it’s to find true love, a bit of romance or just a good time, using a computer to connect with other people is now part of everyday life. The hilarious, painfully embarrassing and poignant stories in this book with remind you to be prepared to kiss a few frogs before you meet the perfect internet date. But the commonsense dating guidelines will help you avoid disasters. Eighty-Eight Dates is a fun collection of anecdotes and advice for anyone interested in what it’s really like to date online. Romantic Journey: Hi, Rachel. Thank you so much for taking time out of your busy schedule to stop by and say hello. I’ve just finished reading Eighty Eight Dates and loved it! It’s scary, funny, downright bizarre in some places and also has a few of those Awww! moments when people met that special somebody they were looking for. It’s also a very practical book full of tips and advice, can you tell us what prompted you to write a book on the do’s and don’ts of Internet Dating? Could you tell us how you carried out the research for EED including one of your own stories – which are hilarious. Rachel Goodchild: I researched heavily for six months. I like to think I was taking one for the team 🙂 I personally went out with over fifty guys in a six month period. The worst moment was when I got banned from one dating site for “researching” and I lost three months of emails! Had to start again. I just did my taxes–do you know how awesome it is to have a dating service as a tax deduction? I went out with both nice and weird people to help men and women everywhere! RJ: What’s the worst date you’ve ever been on? RG: Definitely the one with the guy who was really rude to me about our different political views, then, when I said I didn’t ever “put out” on the first date he said he wouldn’t be paying for dinner then and did I know any girls who DO put out on the first date?! RG: I’m doing all my ideal occupations- I believe life is too short to not just give it all a bit of a shot! RJ: Are you writing anything new at the moment? If so, can you tell us about it? RG: I’m writing a few things. The big two are two books filled with the best advice our parents gave us. I’m planning to release them next year- and all my royalties are going to go to a charity I fully endorse- Shine (www.2shine.org.nz) which helps families experiencing domestic violence. RJ: Besides writing books, do you have a job? Hobbies? RG: I have a pile! I am a mum to three amazing girls who are creative and clever and busy! I raise them by myself and love it. I freelance write for magazines, do a little PR, write my blog askrachel.co.nz, and advice for The Radio Chick website, am the relationships specialist on TVNZ’s website and present a relationships segment on Breakfast with Paul Henry. I also work in the educational field and provide professional development to Early Childhood Teachers. I also write educational books. Hmm guess I could have summed this up with- “yep” huh? Hobbies- reading, walking, food and socialising. love my life nearly all the time! RG: Worst was washing windows when seven months pregnant with our third child as we were so unbearably poor. But I fed my kids! RJ: We know you have a Facebook page, can you give the readers the links to any social networks you have? I have a facebook fan page (Rachel Goodchild), a twitter account (@rgoodchild), and a blog/website www.askrachel.co.nz. RJ: How do you juggle your career as a writer with your career as a journalist – do you have a routine? Or fly by the seat of your pants? RG: I fly by the seat of my pants a bit. I love being busy. I actually like getting up and working between 3-6am, then taking most of the day off to be a mum. RG: If I’m busy I tend to create a writing bunker in my bedroom and come out to throw food together, pass around a few kisses and take kids to school. They actually love what they do- probably because they don’t know anything else! My nine year old has just started her own website www.littlemisspinkhair.co.nz and she wants to work in a creative industry. RG: My first book with Penguin- I listed someone’s age and a few other pieces wrong. I was mortified. I was really careful with Mountain Men and the stories in Eighty Eight Dates were anonymous- phew! RJ: Are you a chest or buns woman? Please give examples of an ideal chest or set of buns and marks out of ten. We will include a photo if possible, purely for educational/illustrative purposes. I like men with a certain sparkle in their eye. For that reason, the men I go for tend to be extremely creative, clever, witty, and fun. Hmm ok- I do like chests better- but not too muscly. RJ: If your life were ever made into a movie, which actress would you like to play you? Why? RJ: If your ship were sinking and you could grab one thing on the way to the lifeboat, what would it be? Go on instinct here; don’t let common sense interfere as you grab your hairdryer or laptop instead of food to take to the desert island. RG: Cellphone. Can still check my email and tweet for 24 hours. But let’s be honest, it’s going to be glued to my hand anyway, so I’m going with sunscreen–there are far worse things than a few months alone on a desert island! RJ: Thanks, Rachel for answering our questions. Best of luck with your writing–we expect to hear from you when your next book comes out!